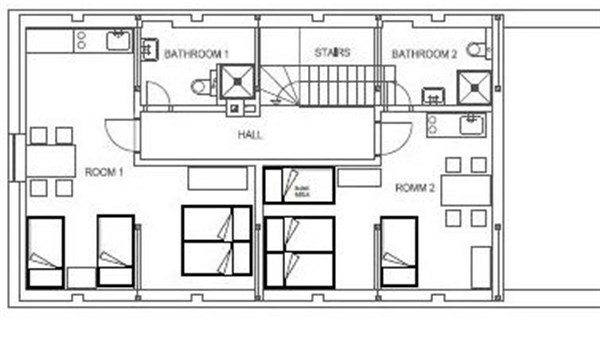 There are 3 bedrooms which provide accommodation for 4-15 people. Rooms and bedrooms: The cottage is ideal for 3 families, who have 3 suits available. Downstairs is bedroom with 4 beds, living room with TV, kitchen with dining table and bathroom. In the living room we are able to provide you with two extra beds. Upstairs there are 2 suits, one with 4 beds and one with 5 beds. Each with it’s own kitchen. There is also the bathroom. Sanitary facility: Bathroom downstairs has a toilet, shower and washbasin. Upstairs there is also toilet, shower and washbasin. Heating: The cottage is heated by convector heaters in each room. Downstairs in kitchen there is a stove. Parking: You can get right next to cottage by car. Parking is provided at fenced garden. Bus station is near the cottage, just about 20 metres. Tran station is in next village, Hrdoňovice. It’s about 500 metres far. The kitchen downstairs is ready to self cooking. Upstairs there is a fridge and hot plate. And some other basic equipment. Shop is about 2 kilometres away in Mladějov or Hrdoňovice. Shopping center is in Jičín about 10 kilometres away. In Jičín there is also a lot of restaurants and café. Kitchen: Fridge with freezer, countertop, table with 10 chairs, stove, radio, cooker with oven, microwave oven, and pot. Bathroom: WC,shower, mirror and basin. Living room: TV, sofa. Bedroom downstairs: 1x doublebed, 1x bunk bed( palanda), 1x night stand, wardrobe. Upstairs first bedroom: 2x bed, 1x double bed. Second bedroom: 1x double bed a 1x bunk bed. In both bedrooms there is table with 4 chairs. In each room there is small kitchen with fridge, hotplate and microwave.In bathroom there is basin, shower and WC. Garage: place for bikes, not for cars,grill, sticks. 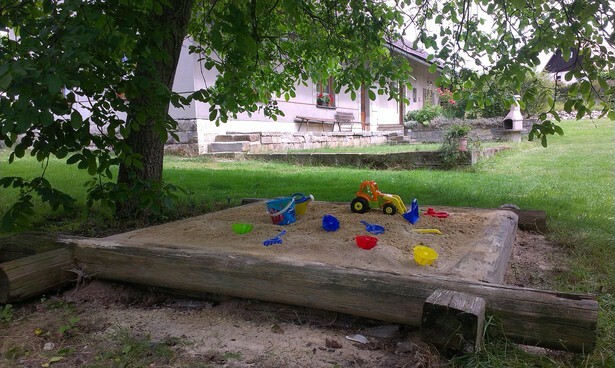 There is also 2 tables with 4 benches, sandpit and garden is fenced. Dryer. WiFi connection. The cottage is located in Bohemian paradise, near Prachov rocks, with nice view of Trosky ruins. It's beautiful place, there is a lot of place where you can go on trip, like castles and ruins. The cottage is located in calm village in the center of Bohemian paradise. It's ideal for tourism, bike riding, mountain climbers and sightseeing. And also for families with childrens and for seniors. In our beautiful region everyone can do what he likes to. The cottage is after reconstruction (2011). Next to cottage there is large garden. Owner does not live in the object.